This first Chapter will educate all teens on the ‘Foreclosure’ process. This will be an intensive 12 week class on aquiring your first property for your own ownership. Students will also be taught how to start and purchase a business, start a technology start up, stock trading, etc. The no money down process information. Foreclosure is a specific legal process in which a lender attempts to recover the balance of a loan from a borrower who has stopped making payments to the lender by forcing the sale of the asset used as the collateral for the loan. This article uses bare URLs for citations. Please consider adding full citations so that the article remains verifiable. Several templates and the Reflinks tool are available to assist in formatting. Formally, a mortgage lender (mortgagee), or other lien holder, obtains a termination of a mortgage borrower (mortgagor)’s equitable right of redemption, either by court order or by operation of law (after following a specific statutory procedure). Usually a lender obtains a security interest from a borrower who mortgages or pledges an asset like a house to secure the loan. If the borrower defaults and the lender tries to repossess the property, courts of equity can grant the borrower the equitable right of redemption if the borrower repays the debt. While this equitable right exists, it is a cloud on title and the lender cannot be sure that (s)he can successfully repossess the property. Therefore, through the process of foreclosure, the lender seeks to foreclose the equitable right of redemption and take both legal and equitable title to the property in fee simple. Other lien holders can also foreclose the owner’s right of redemption for other debts, such as for overdue taxes, unpaid contractors’ bills or overdue homeowners’ association dues or assessments. The foreclosure process as applied to residential mortgage loans is a bank or other secured creditor selling or repossessing a parcel of real property (immovable property) after the owner has failed to comply with an agreement between the lender and borrower called a “mortgage” or “deed of trust.” Commonly, the violation of the mortgage is a default in payment of a promissory note, secured by a lien on the property. When the process is complete, the lender can sell the property and keep the proceeds to pay off its mortgage and any legal costs, and it is typically said that “the lender has foreclosed its mortgage or lien.” If the promissory note was made with a recourse clause then if the sale does not bring enough to pay the existing balance of principal and fees the mortgagee can file a claim for a deficiency judgment. Other types of foreclosure are considered minor because of their limited availability. Under strict foreclosure, which is available in a few states including Connecticut, New Hampshire and Vermont, suit is brought by the mortgagee and if successful, a court orders the defaulted mortgagor to pay the mortgage within a specified period of time. Should the mortgagor fail to do so, the mortgage holder gains the title to the property with no obligation to sell it. This type of foreclosure is generally available only when the value of the property is less than the debt (“under water”). Historically, strict foreclosure was the original method of foreclosure. The process of foreclosure can be rapid or lengthy and varies from state to state. Other options such as refinancing, a short sale, alternate financing, temporary arrangements with the lender, or even bankruptcy may present homeowners with ways to avoid foreclosure. Websites which can connect individual borrowers and homeowners to lenders are increasingly offered as mechanisms to bypass traditional lenders while meeting payment obligations for mortgage providers. Although there are slight differences between the states, the foreclosure process generally follows a timeline beginning with initial missed payments, moving to a sale being scheduled and finally a redemption period (if available). In the United States, there are two types of foreclosure in most common law states. Using a “deed in lieu of foreclosure,” or “strict foreclosure”, the noteholder claims the title and possession of the property back in full satisfaction of a debt, usually on contract. In the proceeding simply known as foreclosure (or, perhaps, distinguished as “judicial foreclosure”), the lender must sue the defaulting borrower in state court. Upon final judgment (usually summary judgment) in the lender’s favor, the property is subject to auction by the county sheriff or some other officer of the court. Many states require this sort of proceeding in some or all cases of foreclosure to protect any equity the debtor may have in the property, in case the value of the debt being foreclosed on is substantially less than the market value of the real property (this also discourages strategic foreclosure). In this foreclosure, the sheriff then issues a deed to the winning bidder at auction. Banks and other institutional lenders may bid in the amount of the owed debt at the sale but there are a number of other factors that may influence the bid, and if no other buyers step forward the lender receives title to the real property in return. Historically, the vast majority of judicial foreclosures have been unopposed, since most defaulting borrowers have no money with which to hire counsel. Therefore, the U.S. financial services industry has lobbied since the mid-19th century for faster foreclosure procedures that would not clog up state courts with uncontested cases, and would lower the cost of credit (because it must always have the cost of recovering collateral built-in). Lenders have also argued that taking foreclosures out of the courts is actually kinder and less traumatic to defaulting borrowers, as it avoids the in terrorem effects of being sued. In response, a slight majority of U.S. states have adopted nonjudicial foreclosure procedures in which the mortgagee (or more commonly the mortgagee’s servicer’s attorney, designated agent, or trustee) gives the debtor a notice of default (NOD) and the mortgagee’s intent to sell the real property in a form prescribed by state statute; the NOD in some states must also be recorded against the property. This type of foreclosure is commonly referred to as “statutory” or “nonjudicial” foreclosure, as opposed to “judicial”, because the mortgagee does not need to file an actual lawsuit to initiate the foreclosure. A few states impose additional procedural requirements such as having documents stamped by a court clerk; Colorado requires the use of a county “public trustee,” a government official, rather than a private trustee specializing in carrying out foreclosures. However, in most states, the only government official involved in a nonjudicial foreclosure is the county recorder, who merely records any pre-sale notices and the trustee’s deed upon sale. 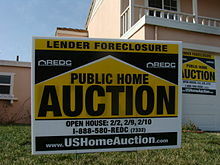 In this “power-of-sale” type of foreclosure, if the debtor fails to cure the default, or use other lawful means (such as filing for bankruptcy to temporarily stay the foreclosure) to stop the sale, the mortgagee or its representative conduct a public auction in a manner similar to the sheriff’s auction. Notably, the lender itself can bid for the property at the auction, and is the only bidder that can make a “credit bid” (a bid based on the outstanding debt itself) while all other bidders must be able to immediately present the auctioneer with cash or a cash equivalent like a cashier’s check. The highest bidder at the auction becomes the owner of the real property, free and clear of interest of the former owner, but possibly encumbered by liens superior to the foreclosed mortgage (e.g., a senior mortgage or unpaid property taxes). Further legal action, such as an eviction, may be necessary to obtain possession of the premises if the former occupant fails to voluntarily vacate. In some states, particularly those where only judicial foreclosure is available, the constitutional issue of due process has affected the ability of some lenders to foreclose. In Ohio, the federal district court for the Northern District of Ohio has dismissed numerous foreclosure actions by lenders because of the inability of the alleged lender to prove that they are the real party in interest. In June 2008, a Colorado district court judge also dismissed a foreclosure action because of failure of the alleged lender to prove they were the real party in interest. In contrast, in six federal judicial circuits and the majority of nonjudicial foreclosure states (like California), due process has already been judicially determined to be a frivolous defense. The entire point of nonjudicial foreclosure is that there is no state actor (i.e., a court) involved. The constitutional right of due process protects people only from violations of their civil rights by state actors, not private actors. A further rationale is that under the principle of freedom of contract, if debtors wish to enjoy the additional protection of the formalities of judicial foreclosure, it is their burden to find a lender willing to provide a loan secured by a traditional conventional mortgage instead of a deed of trust with a power of sale. The difficulty in finding such a lender in nonjudicial foreclosure states is not the state’s problem. Courts have also rejected as frivolous the argument that the mere legislative act of authorizing the nonjudicial foreclosure process thereby transforms the process itself into state action. In turn, since there is no right to due process in nonjudicial foreclosure, it has been held that it is irrelevant whether the borrower had actual notice (i.e., subjective awareness) of the foreclosure, as long as the foreclosure trustee performed the tasks prescribed by statute in an attempt to give notice. “Strict foreclosure” is an equitable right available in some states. The strict foreclosure period arises after the foreclosure sale has taken place and is available to the foreclosure sale purchaser. The foreclosure sale purchaser must petition a court for a decree that cuts off any junior lien holder’s rights to redeem the senior debt. If the junior lien holder fails to object within the judicially established time frame, his lien is canceled and the purchaser’s title is cleared. This effect is the same as the strict foreclosure that occurred at common law in England’s courts of equity as a response to the development of the equity of redemption. In most jurisdictions it is customary for the foreclosing lender to obtain a title search of the real property and to notify all other persons who may have liens on the property, whether by judgment, by contract, or by statute or other law, so that they may appear and assert their interest in the foreclosure litigation. This is accomplished through the filing of a lis pendens as part of the lawsuit and recordation of it in order to provide public notice of the pendency of the foreclosure action. In all U.S. jurisdictions a lender who conducts a foreclosure sale of real property which is the subject of a federal tax lien must give 25 days’ notice of the sale to the Internal Revenue Service: failure to give notice to the IRS results in the lien remaining attached to the real property after the sale. Therefore, it is imperative the lender search local federal tax liens so if parties involved in the foreclosure have a federal tax lien filed against them, the proper notice to the IRS is given. A detailed explanation by the IRS of the federal tax lien process can be found. Because the right of redemption is an equitable right, foreclosure is an action in equity. To keep the right of redemption, the debtor may be able to petition the court for an injunction. If repossession is imminent the debtor must seek a temporary restraining order. However, the debtor may have to post a bond in the amount of the debt. This protects the creditor if the attempt to stop foreclosure is simply an attempt to escape the debt. A debtor may also challenge the validity of the debt in a claim against the bank to stop the foreclosure and sue for damages. In a foreclosure proceeding, the lender also bears the burden of proving they have standing to foreclose. Several U.S. states, including California, Georgia, and Texas impose a “tender” condition precedent upon borrowers seeking to challenge a wrongful foreclosure, which is rooted in the maxim of equity that “he who seeks equity must first do equity,” as well as the common law rule that the party seeking rescission of a contract must first return all benefits received under the contract. In other words, to challenge an allegedly wrongful foreclosure, the borrower must make legal tender of the entire remaining balance of the debt prior to the foreclosure sale. California has one of the strictest forms of this rule, in that the funds must be received by the lender before the sale. One tender attempt was held inadequate when the check arrived via FedEx on a Monday, three days after the foreclosure sale had already occurred on Friday. At least one textbook has attacked the paradox inherent in the tender rule—namely, if the borrower actually had enough cash to promptly pay the entire balance, they would have already paid it off and the lender would not be trying to foreclose upon them in the first place—but it continues to be the law in the aforementioned states. Occasionally, borrowers have raised enough cash at the last minute (usually through desperate fire sales of other unencumbered assets) to offer good tender and have thereby avoided foreclosure or at least preserved their rights to challenge the foreclosure process. Courts have been unsympathetic to attempts by such borrowers to recover fire sale losses from foreclosing lenders. One noteworthy but legally meaningless court case questions the legality of the foreclosure practice is sometimes cited as proof of various claims regarding lending. In the case First National Bank of Montgomery vs Jerome Daly Jerome Daly claimed that the bank didn’t offer a legal form of consideration because the money loaned to him was created upon signing of the loan contract. The myth reports that Daly won, and the result was that he didn’t have to repay the loan, and the bank couldn’t repossess his property. In fact, the “ruling” (widely referred to as the “Credit River Decision”) was ruled a nullity by the courts. In a recent New York case, the Court rejected a lender’s attempt to foreclose on summary judgment because the lender failed to submit proper affidavits and papers in support of its foreclosure action and also, the papers and affidavits that were submitted were not prepared in the ordinary course of business. When the entity (in the US, typically a county sheriff or designee) auctions a foreclosed property the noteholder may set the starting price as the remaining balance on the mortgage loan. However, there are a number of issues that affect how pricing for properties is considered, including bankruptcy rulings. In a weak market the foreclosing party may set the starting price at a lower amount if it believes the real estate securing the loan is worth less than the remaining principal of the loan. In the case where the remaining mortgage balance is higher than the actual home value the foreclosing party is unlikely to attract auction bids at this price level. A house that has gone through a foreclosure auction and failed to attract any acceptable bids may remain the property of the owner of the mortgage. That inventory is called REO (real estate owned). In these situations the owner/servicer tries to sell it through standard real estate channels. The mortgagor may be required to pay for Private Mortgage Insurance, or PMI, for as long as the principal of his primary mortgage is above 80% of the value of his property. In most situations, insurance requirements are sufficient to guarantee that the lender gets some pre-defined percentage of the loan value back, either from foreclosure auction proceeds or from PMI or a combination thereof. Nevertheless, in an illiquid real estate market or following a significant drop in real estate prices, it may happen that the property being foreclosed is sold for less than the remaining balance on the primary mortgage loan, and there may be no insurance to cover the loss. In this case, the court overseeing the foreclosure process may enter a deficiency judgment against the mortgagor. Deficiency judgments can be used to place a lien on the borrower’s other property that obligates the mortgagor to repay the difference. It gives lender a legal right to collect the remainder of debt out of mortgagor’s other assets (if any). There are exceptions to this rule, however. If the mortgage is a non-recourse debt (which is often the case with owner-occupied residential mortgages in the U.S.), lender may not go after borrower’s assets to recoup his losses. Lender’s ability to pursue deficiency judgment may be restricted by state laws. In California and some other states, original mortgages (the ones taken out at the time of purchase) are typically non-recourse loans; however, refinanced loans and home equity lines of credit aren’t. If the lender chooses not to pursue deficiency judgment—or can’t because the mortgage is non-recourse—and writes off the loss, the borrower may have to pay income taxes on the unrepaid amount if it can be considered “forgiven debt.” However, recent changes in tax laws may change the way these amounts are reported. Any liens resulting from other loans taken out against the property being foreclosed (second mortgages, HELOCs) are “wiped out” by foreclosure, but the borrower is still obligated to pay those loans off if they are not paid out of the foreclosure auction’s proceeds. In the wake of the United States housing bubble and the subsequent subprime mortgage crisis there has been increased interest in renegotiation or modification of the mortgage loans rather than foreclosure, and some commentators have speculated that the crisis was exacerbated by the “unwillingness of lenders to renegotiate mortgages”. Several policies, including the U.S. Treasury sponsored Hope Now initiative and the 2009 “Making Home Affordable” plan have offered incentives to renegotiate mortgages. Renegotiations can include lowering the principal due or temporarily reducing the interest rate. A 2009 study by Federal Reserve economists found that even using a broad definition of renegotiation, only 3% of “seriously delinquent borrowers” received a modification. The leading theory attributes the lack of renegotiation to securitization and a large number of claimants with security interest in the mortgage. There is some support behind this theory, but an analysis of the data found that renegotiation rates were similar among unsecuritized and securitized mortgages. The authors of the analysis argue that banks don’t typically renegotiate because they expect to make more money with a foreclosure, as renegotiation imposes “self-cure” and “redefault” risks. Recent housing studies indicate that minority households disproportionately experience foreclosures. Other overly represented groups include African Americans, renter households, households with children, and foreign-born homeowners. For example, statistics show that African American buyers are 3.3 times more likely than white buyers to be in foreclosure, while Latino and Asian buyers are 2.5 and 1.6 times more likely, respectively. As another statistical example, over 60 per cent of the foreclosures that occurred in New York City in 2007 involved rental properties. Twenty per cent of the foreclosures nationwide were from rental properties. One reason for this is that the majority of these people have borrowed with risky subprime loans. There is a major lack of research done in this area posing problems for three reasons. One, not being able to describe who experiences foreclosure makes it challenging to develop policies and programs that can prevent/reduce this trend for the future. Second, researchers cannot tell the extent to which recent foreclosures have reversed the advances in homeownership that some groups, historically lacking equal access, have made. Third, research is focused too much on community-level effects even though it is the individual households that are most strongly affected. Many people cite their own or their family members medical conditions as the primary reason for undergoing a foreclosure. Many do not have health insurance and are unable to adequately provide for their medical needs. This again points to the fact that foreclosures affects already vulnerable populations. In 2009 the United States Congress tried to rescue the economy with a $700 billion bailout for the financial industry, however there was a growing consensus that the deepening collapse of the housing market was at the heart of the country’s acute economic downturn. After spending billions of dollars rescuing financial institutions only to see the economy spiral even deeper into crisis, both liberal and conservative economists and lawmakers pushed to redirect an economic stimulus bill to what they saw as the core problem: the housing market. But beneath the consensus over helping the housing market, there were huge differences over who should benefit under the competing plans. Democrats wanted to aim money directly at people in the greatest distress; and Republicans wanted to aim money at almost all homebuyers, on the theory that a rising tide would eventually lift all boats. In 2010 there was a 14% increase in the number of homes receiving a default notice between July and September. In that year one in every 45 homes received a foreclosure filing and the problem has become more widespread with the increasing rates of unemployment across the nation. Banks have become extremely aggressive without much patience for those who have fallen behind on their mortgage payments, and there are more families entering the foreclosure process sooner than ever. This year, 2011, banks are on track to repossess over 800,000 homes. In 2010, the highest rates of foreclosure filings were in Las Vegas, Nevada; Fort Myers, Florida; Modesto, California; Scottsdale, Arizona; Miami, Florida; and Ontario, California. The geographic diversity of these cities is made up for by the fact they these are all relatively metropolitan areas. Big cities like Houston, Texas saw a 26% increase in 2010, 23% in Seattle, Washington and 21% in Atlanta, Georgia. On the opposite end of the spectrum, the cities with the lowest rates of foreclosure were Rome, NY; South Burlington, VT; Charleston, WV; Bryan, TX; and Tuscaloosa, AL. The impact of foreclosure goes beyond just homeowners but also expands to towns and neighborhoods as a whole. Cities with high foreclosure rates often experience more crime and thefts with abandoned houses being broken in to, garbage collecting on lawns, and an increase in prostitution. Foreclosures also impact neighboring housing sales on two levels—space and time. For any given time frame, foreclosures have a greater negative impact when they are closer to the property attempting to be sold. The conventional view suggested is that the increase in foreclosures will cause declines in the sales value of neighboring properties, which, in turn, will lead to an extension of the housing crisis. Another significant impact from increased foreclosure rates is the effect it has on school mobility of children. In general, research suggests that switching schools is damaging for children, although this does significantly depend on the quality origin and destination schools. A study done in New York City revealed that students who changed schools most often entered a school with lower, on average, test scores and overall school performance. The effect of these moves on academic performance for individual students is something needing further research. Foreclosures also have an emotional and physical effect on people. In one particular study of 250 recruited participants who had experience foreclosure, 36,7% met screening criteria for major depression. Australia and New Zealand: Foreclosures are generally referred to as Mortgagee sales or Mortgagee auctions. In those cases, the bank or lender (“Mortgagee”) sells under the terms of the mortgage. In both of these countries statutory reform has altered the manner in which real property dealings are conducted. What is termed a “mortgage” is a charge that is registered against the title of the property. Since in both countries, the Torrens title system of land registration is used, being registered as proprietor or as a mortgagee creates an indefeasible interest (unless the acquisition of the registration was by land transfer fraud). The mortgagee therefore never holds any title documents, and there is a statutory process for initiating and conducting a mortgagee sale in the event that the mortgagor defaults. In New Zealand, the land title database is now electronic so there are no paper “title documents”. United Kingdom: Foreclosure is a little used remedy which vests the property in the mortgagee with the mortgagor having no right to any surplus from the sale. Because this remedy can be harsh, courts almost never allow it. Instead, they usually grant an order for possession and an order for sale, which mitigates some of the harshness of the repossession by allowing the sale. Ireland: Foreclosure has been abolished by the Land and Conveyancing Reform Act 2009 but Chapter 4 of Part 9 of the National Asset Management Agency Act 2009 provides for vesting orders that are equivalent to foreclosure but may only be used by NAMA. Switzerland: Foreclosure takes place as a form of debt enforcement proceedings under Swiss insolvency law. People’s Republic of China: Foreclosure takes place as a form of debt enforcement proceedings under strict judicial foreclosure, which is only allowed by law of guarantee and law of property right. Philippines: There are two modes of foreclosure in the Philippines. A mortgagee may foreclose either judicially or extrajudicially, as governed by Rule 68 of the 1997 Revised Rules of Civil Procedure and Act. No. 3135, respectively. A judicial foreclosure is done by filing a complaint in the Regional Trial Court of the place where the property is located. The judge renders judgment, ordering the mortgagor to pay the debt within a period of 90–120 days. If the debt is not paid within the said period, a foreclosure sale satisfies the judgment. In an extrajudicial foreclosure, the mortgagee need not initiate an action in court but may simply file an application before the Clerk of Court to secure attendance of the Sheriff who conducts the public sale. This is done pursuant to a power of sale. Note that these two modes specifically apply to real estate mortgages. Foreclosure of chattel mortgages (mortgage of movable property) are governed by Sec. 14 of Act No. 1506, which gives the mortgagee the right to sell the chattel at a public sale. It has also been held that as regards chattel mortgages, the law does not prohibit that the foreclosure sale be done privately if it is agreed upon by the parties. South Africa: For a developing country, there is a high rate of foreclosures in South Africa because of the privatisation of housing delivery. [neutrality is disputed] One of the biggest opponents of foreclosures is the Western Cape Anti-Eviction Campaign which sees foreclosures as unconstitutional and a particular burden on vulnerable poor populations. Spain: Unlike in the United States, where a foreclosure means the end of the line, the foreclosure hearing in Spain is just the beginning of the homeowner’s troubles. They will have to work for the bank for many years and will be unable to ever own anything—even a car. Spanish mortgage holders are responsible for the full amount of the loan to the bank in addition to penalty interest charges, and court fees. Much of this can be attributed to Spain having the highest unemployment rate in the “euro zone.” Unlike in the US, bankruptcy is not an adequate solution since mortgage debt is specifically excluded. Unlike other European countries, you cannot go to the courts for any sort of debt relief. There has been much contention over these policies in the Spanish Parliament but the government is convinced that keeping these policies will prevent Spanish banks from ever experiencing something similar to the US mayhem.